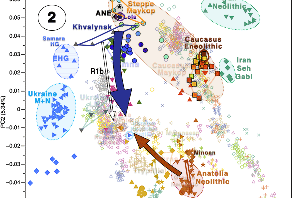 My speculative bet on the arrival of haplogroup R1b to Europe (and the expansion of R1b-V88 to Africa through southern Italy) was based initially entirely on genomic (especially phylogeographic) finds, but judging by data on the latest papers on south-eastern Europe it seems to have been the right choice. 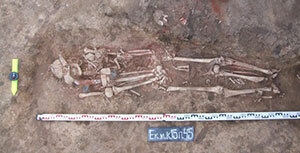 Archaeological information on these prehistoric periods is scarce – compared to more recent times -, and anthropological models of migration are therefore speculative. Some information on the potential periods for its expansion are contained in the chapter Social Networks and Connectivity among the Palaeolithic and Mesolithic Foragers of the Balkans and Italy, by Dušan Borić and Emmanuela Cristiani, in R. Krauß, and H. Floss (eds.) Southeast Europe before the Neolithisation (Proceedings of the workshop held in Tübingen, Germany, May 9th, 2014). 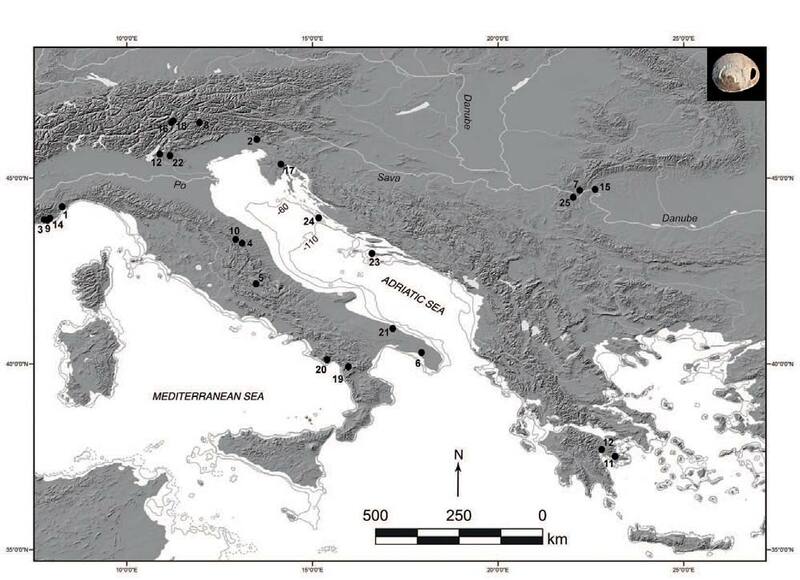 Major environmental perturbations over the last glacial period, with considerable changes in sea levels, have significantly affected the spatial organization of Palaeolithic and Mesolithic hunter-gatherer communities between the Balkans and Italy. For this reason, these regions are an ideal case for studying how different environmental factors could affect connectivity among human groups and rates of innovation. 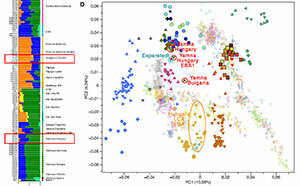 Italy and the Balkans are also key transitory regions for various dispersal events in the evolutionary history of the European continent that brought different hominin taxa into Europe from the areas of Africa and south-western Asia. Yet, compared to various well-researched regional hotspots in central and western Europe, the picture of the Palaeolithic and Mesolithic adaptations remains coarse-grained in particular in the Balkans as a result of a historical research bias followed by unsettled recent history preventing the application of new research methodologies. 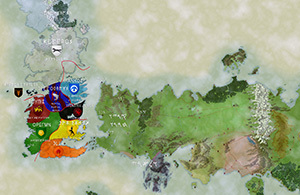 In this paper, we aim to highlight particular examples of connectivity across large tracks of land during the Palaeolithic and Mesolithic and to point out the potential that social network thinking has in the study of the Balkans and Italy. These are most frequently points (pointes à cran), but other tool morphologies (e.g., blades) are also found with recognizably tapered and retouched bases used for hafting. The appearance of this innovation has often been associated with the Early Epigravettian period in the Balkans and Italy. 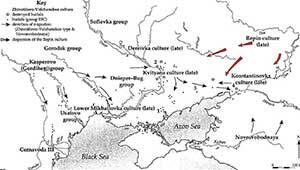 It has been assumed that this innovation spread from Gravettian cultures of central Europe, possibly even as part of actual population movements from central Europe into southern European refugia at the time of the worsening of climatic conditions in the course of the LGM. Such processes might have led to the patterning of archaeological evidence that is referred to as ‘the shouldered point horizon’ (Kozlowski 2008). 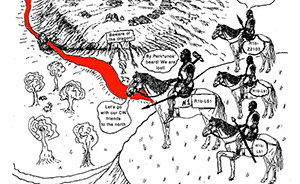 An alternative or complementary explanation could be that the spread of this particular hafting innovation as a possible improvement in hunting techniques was part of knowledge transfers that were enabled by the existence of well connected social networks that might have in part been prompted by the worsening of the climatic conditions with the onset of the LGM. 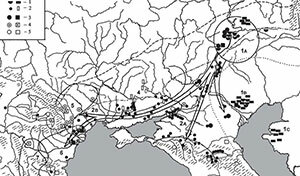 One could envisage that the frequency of ‘arrythmic’ processes of population contraction and dispersal across these regions during the Gravettian and Early Epigravettian periods might have in part contributed to the need for reliable social networks across long distances with transferability of knowledge and know-hows between forager groups. In this context, the emergence and spread of a particular technological innovation is only an epiphenomenon of social arrangements that were at this time already in place beyond the territories of the adjacent regional bands. Map showing the distribution of sites with shouldered points in the Balkans and Italy. Bathymetric contours show the drop of sea levels –110m during the LGM climax and –60m by the end of the Pleistocene. 1. Arene Candide; 2. Cala della Ossa; 3. Canicattini Bagni; 4. Cavernette Falische (Cenciano Diruto, Lattanzi, Sambuco); 5. Cipolliane C; 6. Clemente Tronci; 7. Crvena Stijena, layer IX; 8. Fanciulli; 9. Kadar; 10. Kastritsa; 11. Kephalari; 12. Klissoura 1, layer IIb; 13. Maurizio; 14. Mura; 15. Niscemi; 16. Orphei (Tchoutchoura); 17. Ovcˇja Jama; 18. Paglicci; 19. Paina; 20. Poggio alla Malva; 21. Romito; 22. Šalitrena; 23. Šandalja II; 24. Seidi; 25. Settecannelle; 26. Taurisano; 27. Vrbicˇka; 28. Zakajeni spodmol; 29. Županov spodmol. Similarities between the Epigravettian levels of Cuina Turcului and Climente II in the Danube Gorges and Settecannelle are also found in their respective lithic industries, and include the presence of backed curved points and numerous circular thumbnail scrapers, backed blades and double backed blades with inverse proximal retouch (Chirica 1999). These techno-morphological traits are common for the Tardiglacial lithic industries across the central-eastern Mediterranean regions: southern France, Italy, and the Balkans (Broglio/Kozlowski 1987; Kozlowski 1999). In addition, a similar range of ornamental beads made of marine gastropods, in particular Cyclope neritea, as well as red deer canines were used at these two distant and broadly contemporaneous Late Epigravettian sites. 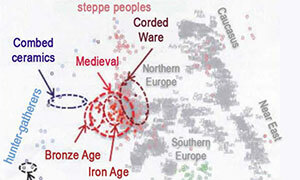 While some of these similarities between these regions must have stemmed from older shared cultural repertoires and can be interpreted as a consequence of branching cultural processes, striking similarities in decorative motifs used around the same time can hardly be explained by convergent and independent innovations in these two distant regions. The distance between Settecannelle and Cuina Turcului is around 900 km as the cow flies and certainly longer taking into account geographic and other limitations and difficulties in traveling. 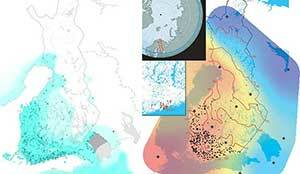 In our opinion, the observed similarities could better be explained by long distance connections along established social networks beyond adjacent maximal/regional band territories. During the periods in question, either during the Bølling/Allerød interstadial or in the course of the Younger Dryas, one should envisage relatively open and in places sparsely forested landscapes. 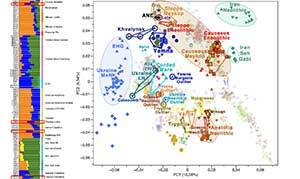 It should be noted, however, that based on more recent syntheses of the pollen data, and additional direct dating of macro-charcoal remains of identified tree species, during the glacial periods, south-eastern European landscapes were not steppe lands as previously thought. Around 40% of the total pollen comes from coniferous, needle-leaved tree types, such as pine (Pinus). But there is also good evidence of the refugial survival of deciduous, broad-leaved species of trees, such as oak (Quercus) and hazel (Corylus), as small pockets in predominantly coniferous forests. In addition, south-facing slopes might have also preserved deciduous tree species. In particular, midaltitude, mountainous locations with higher levels of precipitation might have been favourable for the survival of forests, with low altitude locations being too dry and high altitude locations being too cold (Willis 1994; 1996; Willis/van Andel 2004). All the same, traversing long distances across Tardiglacial landscapes of southern Europe might have been a considerably easier task than during the Early Holocene. In addition, the lower sea levels in the Adriatic might have still allowed a short-cut communicative route from the Balkan hinterland when traversing across the northern half of the Great Adriatic Plain into Italy. These environmental and geographic factors, coupled with the need to maintain long-distance contacts, perhaps partly as safety nets in unpredictable and harsh climatic conditions among small-world societies (see above), could be a possible way to explain the existence of such long-distance connections during this period. But, as previously emphasized, connectivity need not be interpreted as stemming out of utilitarian and rational motivations only. Fig. 8. Map showing the distribution of Upper Palaeolithic and Mesolithic sites with Cyclope neritea, ornamental beads in the Balkans and Italy. Bathymetric contours show the drop of sea levels –110m during the LGM climax and –60m by the end of the Pleistocene. 1. Arene Candide; 2. Biarzo; 3. Bombrini; 4. Continentza; 5. Continenza; 6. Cavallo; 7. Cuina Turcului; 8. Dalmeri; 9. Fanciulli; 10. Ferrovia; 11. Franchthi; 12. Fumane; 13. Klissoura 1; 14. Mochi; 15. Ostrovul Banului; 16. Pradestel; 17. Pupic´ina; 18. Romagnano III; 19. Romito; 20. Serratura; 21. S. Maria di Agnano; 22. Tagliente; 23. Vela Spila; 24. Vlakno; 25. Vlasac. 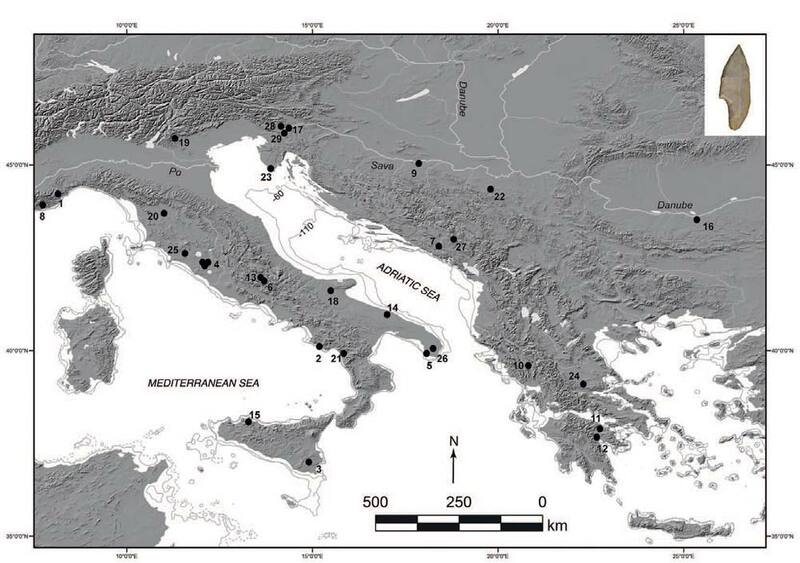 Featured image, from the chapter: Map showing the distribution of sites with shouldered points in the Balkans and Italy. Bathymetric contours show the drop of sea levels –110m during the LGM climax and –60m by the end of the Pleistocene. 1. Arene Candide; 2. Cala della Ossa; 3. Canicattini Bagni; 4. Cavernette Falische (Cenciano Diruto, Lattanzi, Sambuco); 5. Cipolliane C; 6. Clemente Tronci; 7. Crvena Stijena, layer IX; 8. Fanciulli; 9. Kadar; 10. Kastritsa; 11. Kephalari; 12. Klissoura 1, layer IIb; 13. Maurizio; 14. Mura; 15. Niscemi; 16. Orphei (Tchoutchoura); 17. Ovcˇja Jama; 18. Paglicci; 19. Paina; 20. Poggio alla Malva; 21. Romito; 22. Šalitrena; 23. Šandalja II; 24. Seidi; 25. Settecannelle; 26. Taurisano; 27. Vrbicˇka; 28. Zakajeni spodmol; 29. Županov spodmol.